Bang Bo - Asia Production Quality Award was held once again on February 2nd, 2018 at Toyota Daihatsu Engineering & Manufacturing (TDEM), Bang Bo, Thailand. This event is a annual event that held every once a year ever since 2011. This activity is organized by Toyota Daihatsu Engineering & Manufacturing (TDEM) with the objective to increase the motivation of Toyota's affiliates in Asia Pacific to be competed in improving the quality. PT. 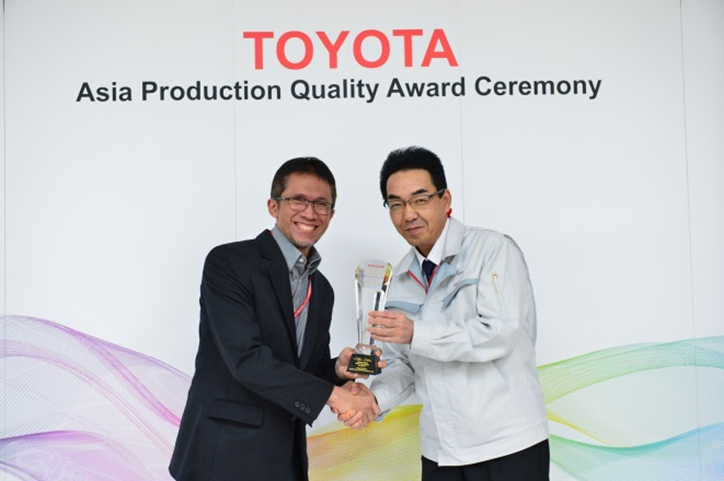 Toyota Motor Manufacturing Indonesia (TMMIN) was awarded the 4th Asia Production Quality Award in two award categories, Warranty Reduction Award and Excellent Company Award with a score of 80 > 70. Both awards were directly given by the President Director. Tatsuro Takami to Technical Director TMMIN, Mr. Yui Hastoro. Previously TMMIN has been awarded Asia Production Quality with Warranty Reduction and Zero Field Action categories in 2016. This award is given to TMMIN for the success of TMMIN in doing shop floor management improvement become extended to supplier. Not only that, a team of Toyota Indonesia is solid in facing Shipping Quality Audit (SQA). Hopefully with this Asia Production Quality Award, TMMIN can improve the quality to face the company competitiveness in the global market so it can contribute more to Indonesia.